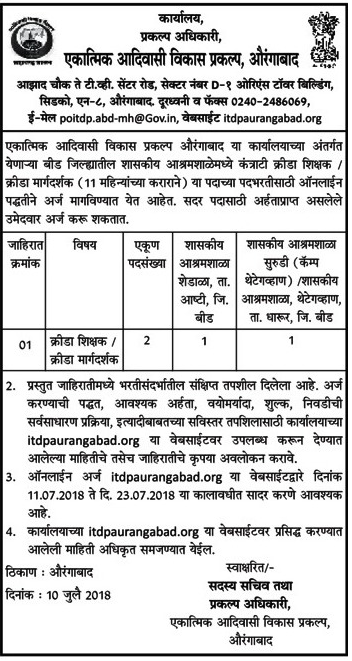 ITDP Aurangabad (Integreted Tribal Development Department, Aurangabad), Aurangabad Published Job Notification for 02 Sports teacher & Sports guides Posts. Candidates who wish to apply must look at ITDP Aurangabad Sports teacher & Sports guides Recruitment 2018. Eligible candidates can apply Offline before 20-07-2018. Starting Date, Last Date to Apply Offline at Integreted Tribal Development Department, Aurangabad which candidates should be remembers as follows. 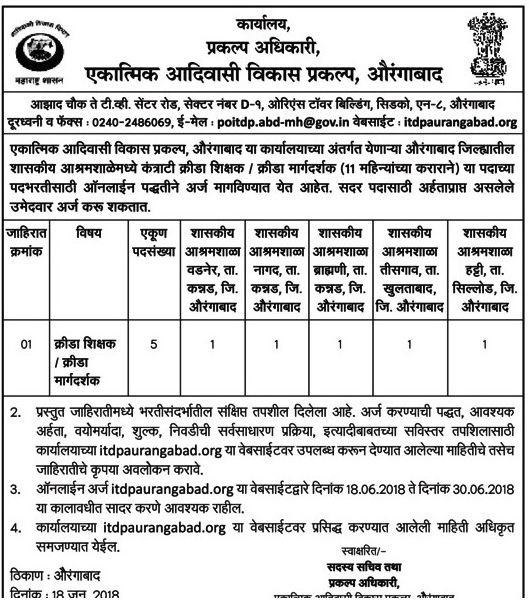 ITDP Aurangabad (Integreted Tribal Development Department, Aurangabad), Aurangabad Published Job Notification for 05 Sports Teacher/ Sports Guide Posts. Candidates who wish to apply must look at ITDP Aurangabad Sports Teacher/ Sports Guide Recruitment 2018. Eligible candidates can apply Offline before 30-06-2018. Last Date to Apply Offline: 30-06-2018.